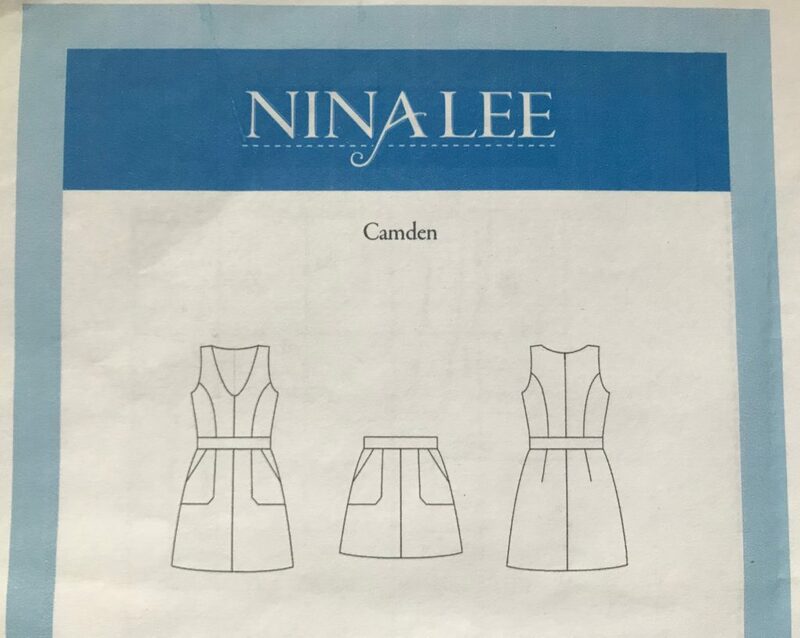 When this pattern was recently released by Nina Lee and the pattern tester’s versions were popping up in my Instagram feed, I immediately fell in love with the design and it jumped right to the top of my sewing list!! I love, love, love the pinafore but decided to play it safe and make the skirt first! 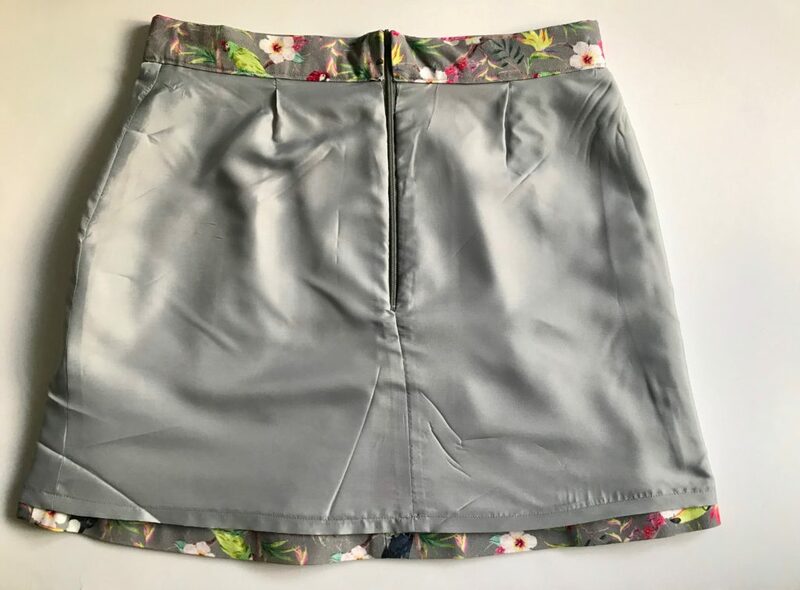 I love the simplicity of the skirt, yet the design details really open up opportunities for customising the skirt which is what I really wanted to do. I bought the fabric recently with a skirt in mind but hadn’t decided on which pattern to use. I wouldn’t wear a whole dress out of this fabric but a skirt I would definitely wear! 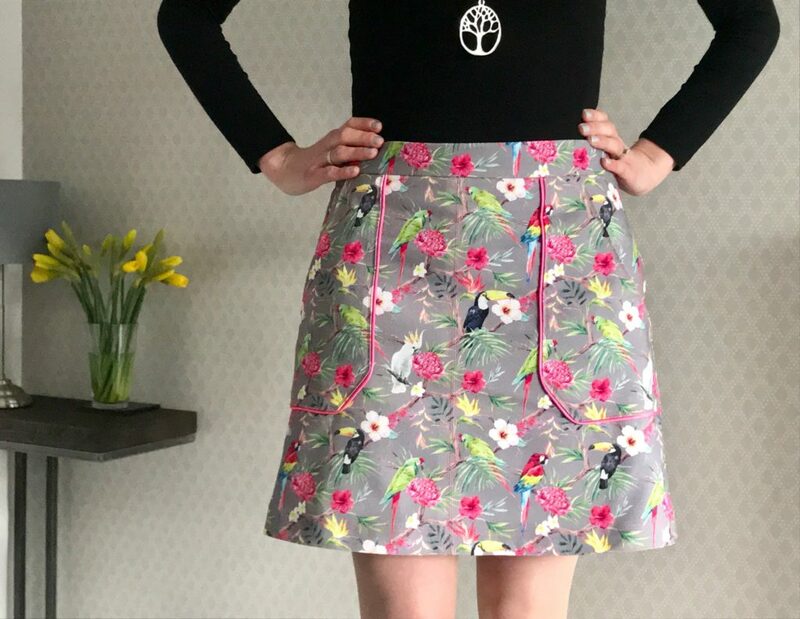 Interestingly I think if I saw a skirt in this fabric on the high street I wouldn’t be drawn to it but that’s what I love about dressmaking – I feel a lot braver with design choices and the ability to create something totally unique – it’s so exciting! 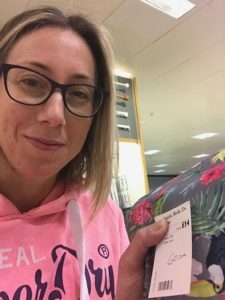 The fabric is a medium weight cotton – it kind of feels the weight you might make cushion covers with or a bag – it felt it had the perfect body to hold the A-line shape of the Camden skirt. The pockets of the skirt are so beautiful and I felt the shape of them would be lost with such a busy print. Bring on the pink piping!!! I definitely wanted to highlight the inner edges of the patch pockets with piping and kept an open mind about whether to do piping along the centre seam of the skirt/lower waist band edge. 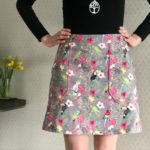 Upon studying the details of the skirt – the patch pockets and centre front seam (not that common for a skirt – the front tends to be one piece cut on the fold), I realised I needed to try and pattern match the fabric – this wasn’t necessarily going to be the straightforward make that I thought it might be initially! I would not be a happy girly if I had a parrot’s head chopped off or some kind of malaligned parrot/toucan hybrid!! Pattern matching where possible it was then! My waist measurement was 32” which was bang on size 14 on the pattern body measurements chart. My hips were 38” which were in between a 10 and 12. I couldn’t come down a size at the waist as looking at the finished garment measurements, there was only 1” of ease included so I decided to grade the pattern from a 14 at the waist to 12 at the hips. I did increase the length of the pattern by 3” but at the end took most of that off as realised it was too long. As I had set myself the challenge of pattern matching I decided to cut out the fabric in stages, not all at once, in the order that I needed them. The first stage was attaching the pockets. I needed to pattern match one of the patch pockets to one skirt front piece and the same for the other side. Before sewing the pockets on, the pockets need to be lined. I chose a grey satin lining I had in my stash and was just what I was after. 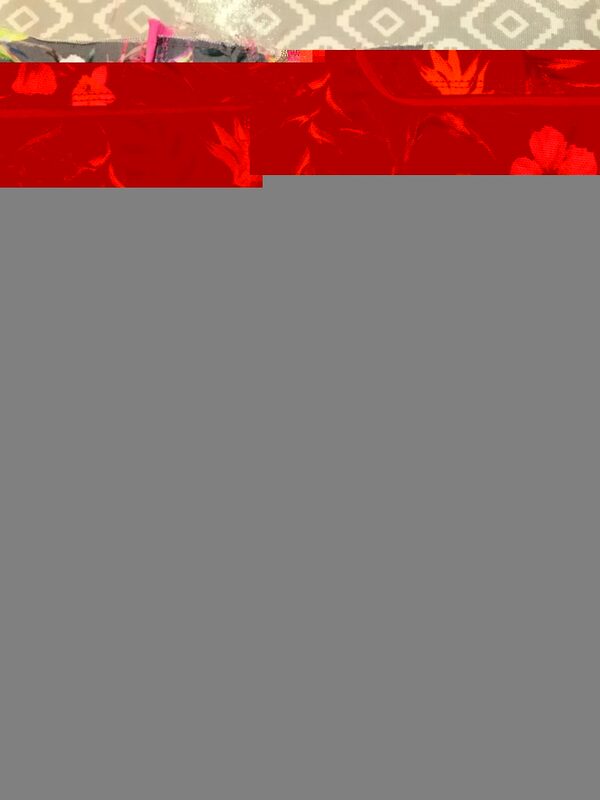 This would be the lining for the main skirt too. I would also need to make my piping and sew the piping to the pocket edges before sewing them to the skirt . 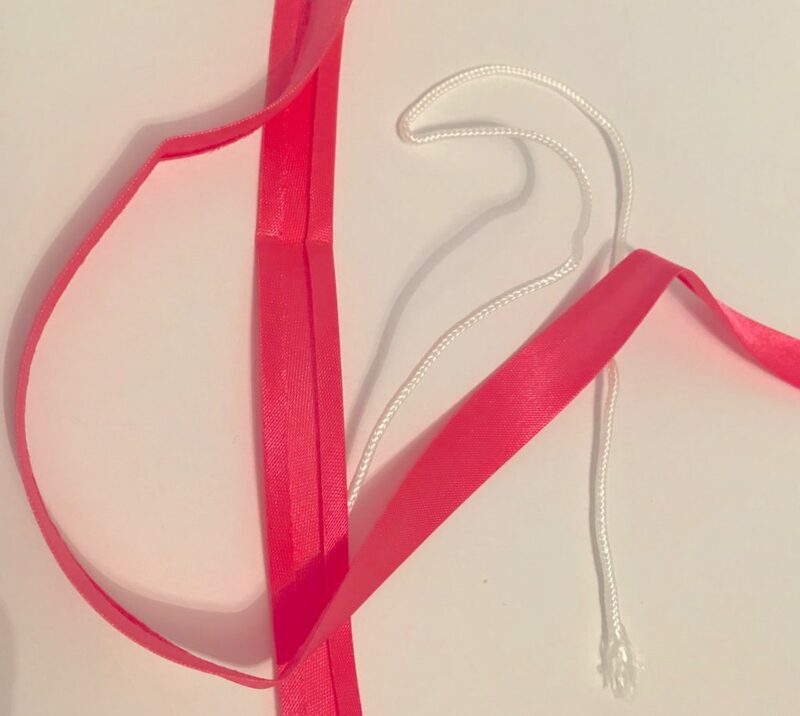 For the piping I used a really small piping cord and hot pink satin bias binding. This was quite tricky as the bias binding was both narrow and slippy! An absolute must for doing this is an adjustable zipper foot or piping foot for your machine. 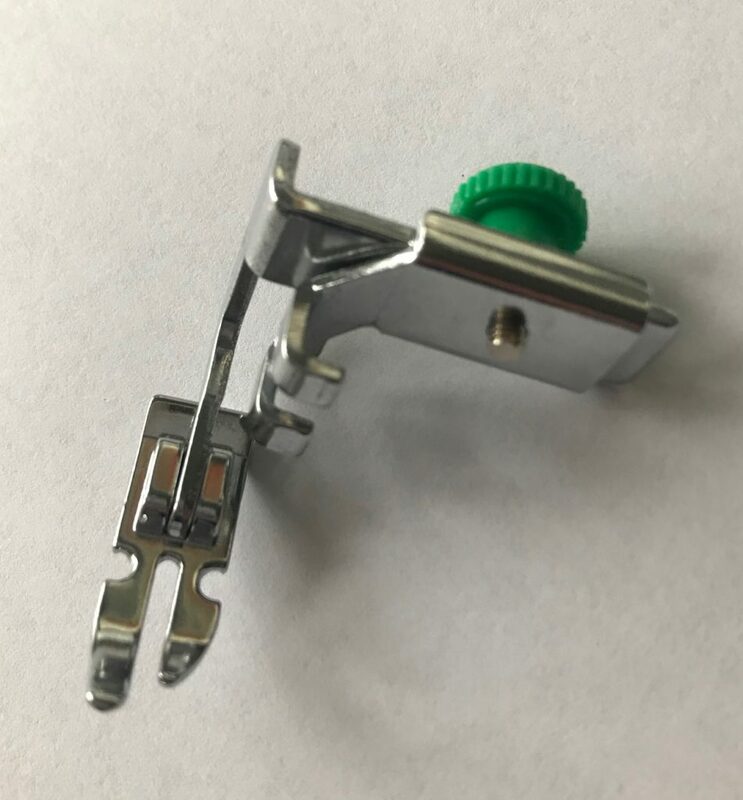 This foot allows you to sew really close to the piping cord, creating really neat piping. Once the piping was attached to the edge of the lined pocket with a single row of pink stitching, I then positioned the pocket in place and stitched with a second row of pink stitching. This process was repeated for the other side of the skirt, having cut out the skirt piece carefully so that the pattern matched down the centre seam. I was really chuffed with the pattern matching along the centre seam – I think it’s hard to tell that they are actually 2 separate pieces of fabric. In order to highlight the centre seam I top stitched 2 lines of pink stitching parallel to the centre seam on either side. Having attached one of the back skirt pieces I then came to attach the second back skirt piece. Problem…. in my attempts at pattern matching the 2 back pieces, I had mistakenly cut out 2 pieces the same, instead of mirror images of each other (one for the left and one for the right side). Arrrrrgggghhh! Cutting out 2 back left pieces by mistake! I then realised that I didn’t have enough fabric left with that pattern repeat in – double arrrrrgghh! That is one of the issues with pattern matching in that you do need more fabric than you would if you had a plain fabric or one that you weren’t patttern matching. I was left with smaller pieces of fabric that weren’t useable – think of a big piece of fabric with lots of cut out holes in it!! The next day it was back to the shop, keeping my fingers and toes crossed that they would still have some of the fabric left. I was like a crazy lady in the haberdashery searching for this bolt of fabric (more akin to supermarket sweep or challenge Anneka!!) I eventually found it, it felt like winning the lottery (well not quite but certainly close!). Armed with the extra fabric, I then had to pre wash it and finally dry I was able to continue with the skirt!!! The invisible zip went in well the first time. I wasn’t quite as pleased with the pattern matching across the invisible zip section of the back seam. 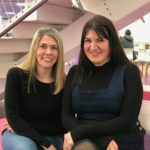 I contemplated unpicking it but thought it could turn out worse the second time so decided that it was most definitely ‘good enough’ and have learnt over the last few years that perfection is almost impossible to achieve. To strive for it at the expense of other things is definitely not healthy! 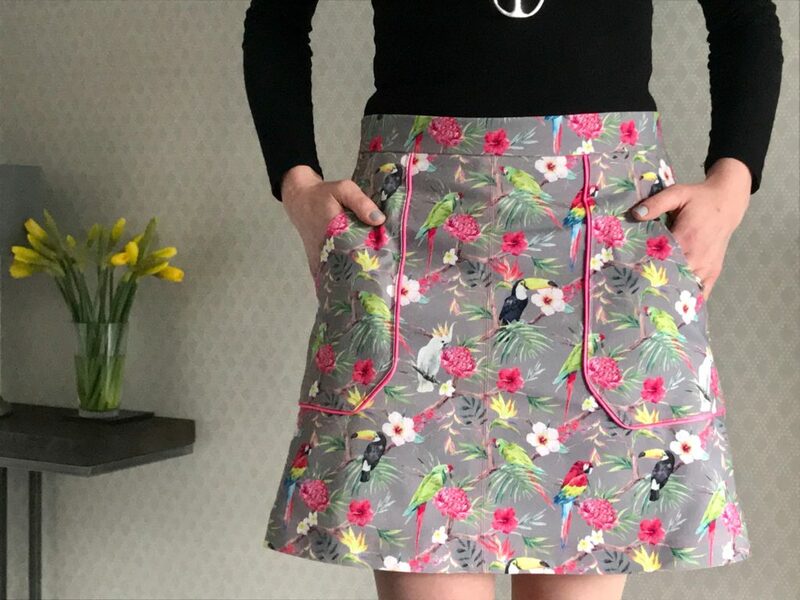 I was really pleased with how the waistband seams lined up either side of the zip and so proud of how it was turning out – I was happy!! 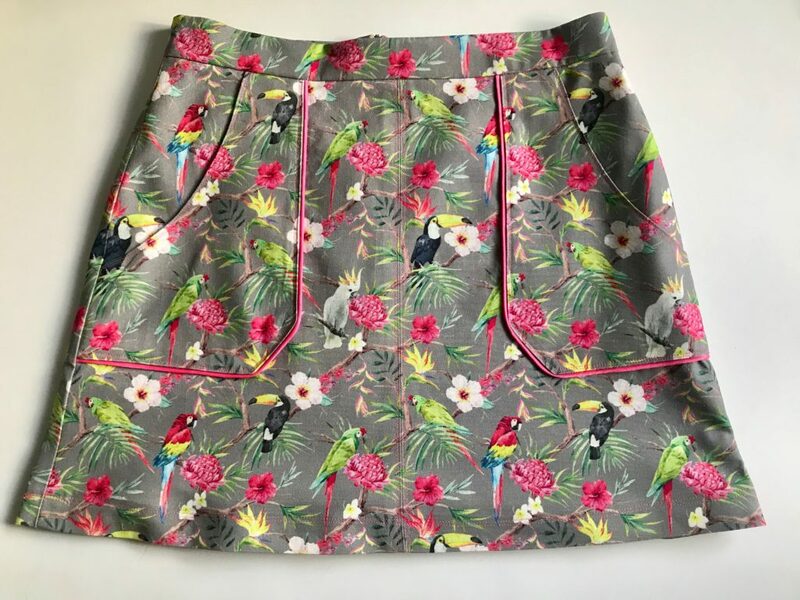 Back seam – booo that toucan’s head!!! Having hand stitched the lining around the zip, it was really coming together and all that was left to do was to hem the lining and skirt. So after allllllll that – let’s see the finished skirt!!!!!! 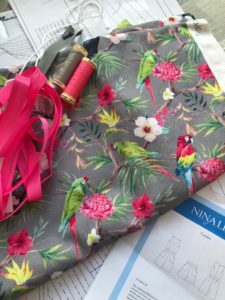 This project felt like it definitely stretched some of my dressmaking skills – the main one being pattern matching. I really did have to take my time, plan and concentrate on what I was doing and what I was trying to achieve. 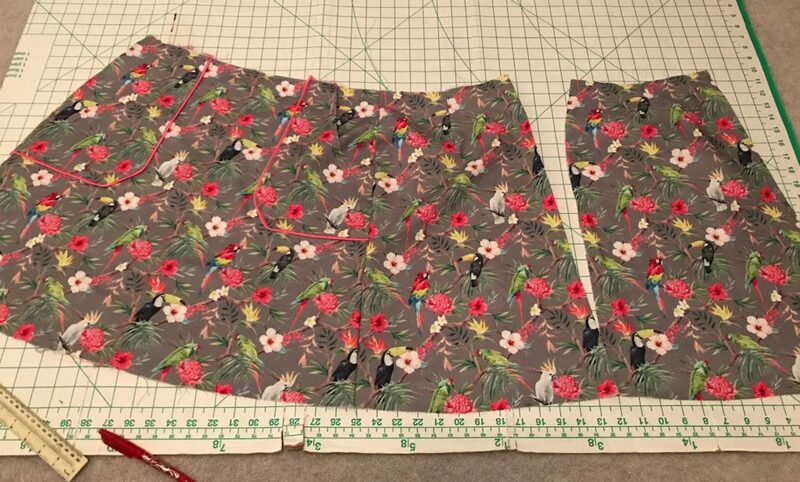 Having made the mistake of cutting out 2 skirt pieces the same, I have also learnt from that, so next time hopefully I won’t make the same mistake again! 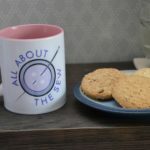 I also felt like it brought together lots of other skills that I already had like making my own piping, lining a garment, inserting an invisible zip and attaching a waist band but it felt like it all came together really smoothly – like a culmination of all the practice and sewing I had done before – it felt good!!! I am really proud of this make and absolutely cannot wait to wear it! 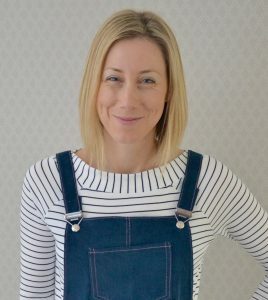 Next up – the Camden pinafore in denim – watch this space!! Lorna, amazing love it, well done. I love the pattern and the material, my type of skirt.